Chevrolet showed of the refreshed 2019 Spark in Korea (after showing it off for the North American market last April) showcasing a new design identity with modernized styling and upgraded safety and convenience features. The 2019 Spark offers a modern reinterpretation of Chevrolet’s lean muscularity design language. The dual-port grille uses chrome while the lower grille has been reshaped to improve aerodynamic performance while giving the Spark a more muscular appearance. The changes are capped off with new projector-type headlamps with available LED daytime running lights and redesigned 15-inch alloy wheels. Inside, the new Spark offers colorful accent colors available in Dark Silver or Orange or Blue. The accent color is featured on the borders of the air vents on either side of the center fascia and in the center line of the driver and passenger seats. Upper trims also have a driver armrest. The Chevrolet MyLink infotainment system, located in the upper part of the center console, has been revamped with a new home screen, 6 speakers, and an optional first-in-segment USB Type-C connector. The system also incorporates a valet mode which limits vehicle accessibility when the Spark is driven by someone else other than its owner. In Korea, the 2019 Spark is equipped with Low-Speed Collision Mitigation Braking, which automatically actuates the brakes in the event of an imminent collision at a speed below 60 km/h. Forward Collision Alert detects and prevents potential accidents and notifies the driver in unforeseen situations or driving while drowsy. The segment-exclusive Lane Departure Warning and Side Blind Spot Alert systems monitor not only the front and rear of the vehicle, but also the sides, for 360-degree protection. 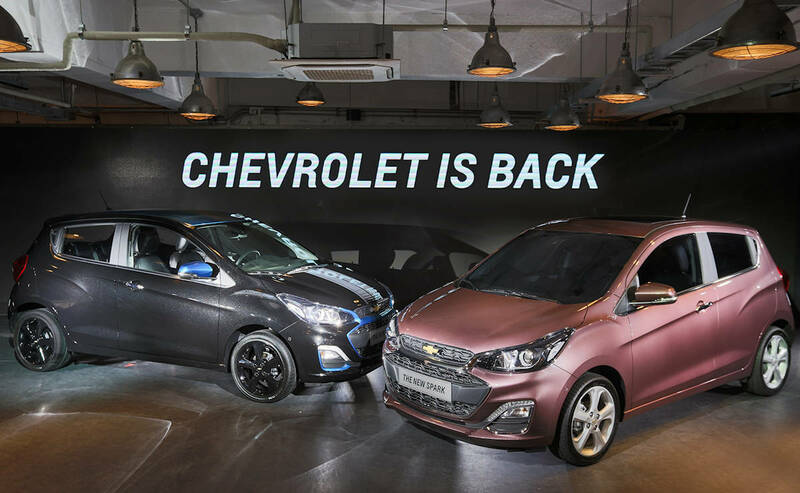 While Chevrolet Philippines has yet to confirm when the 2019 Spark would be made available locally, given that our supply comes from Korea, it is just going to be a matter of time.